Hello! This is derpchan, the member of This is Sternbild who can’t stop blogging! More episode titles were posted today. No speculation from me at this stage. I’ll watch at least episode 14 first to see where things are going. See ya! Well now. Episode 12 went totally differently from what we expected. Guess it’s best to rethink what we thought we knew (next Saturday it’ll turn out to be just a load of marsh gas after another plot twist). I decided to take a closer look at where the episode titles come from and what are they mean, and how they relate to each episode. They’re all sayings, quotes and proverbs, mostly in English. Meaning: A risky enterprise is justified so long as it turns out well in the end. 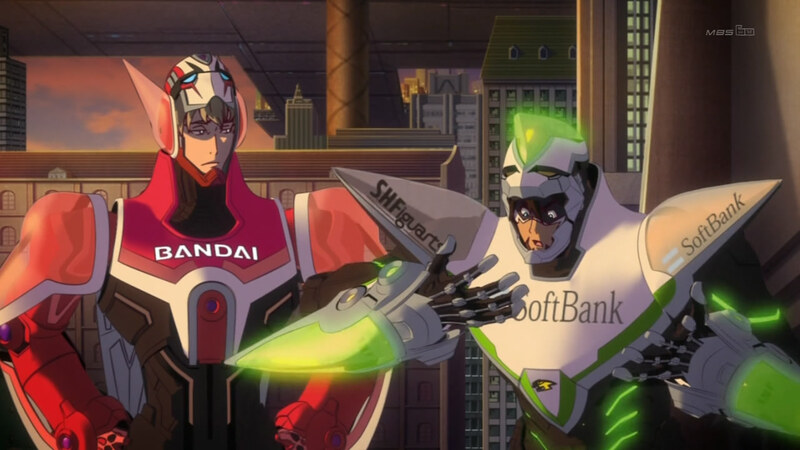 Obviously this refers to Kotetsu and Barnaby becoming the first hero team. Meaning: Start off on a good note to reap the benefits at the end. This could mean a couple of things. Kotetsu and Barnaby don’t exactly get a good start, so I think it refers more to Tony (the NEXT kid who controlled the statues) making a new start for himself and realizing he can use his powers for something good. The Japanese title means “beginnings are fundamental” and Aki thinks it might refer to Barnaby saving Kotetsu’s daughter which got Kotetsu to warm up to him a bit. Meaning: The truth is often found in comic utterances. Kotetsu: Figure it out yours- *sees Agnes glaring* Which you don’t have to do. What are you looking at? Kotetsu: That’s also a building. Also, the thing next to it is a building and the thing in front of it is also a building. Well… all the building-like structures you can see here are buildings. Yeah, well… It could also refer to the hilarious top/bottom conversation (you know what I mean) during the bomb defusing scene. The Japanese title means “the truth that came from the lie”. We aren’t sure what the truth could be (maybe their budding teamwork?) but the lie might be the so called “date” which was done just for show so Hero TV could film it. Meaning: An attempt is sometimes easier than expected. This is a Japanese proverb. 「案ずるより産むが易し。」 translates to “giving birth to a baby is easier than worrying about it”. This episode was about Karina and her doubts about continuing as a hero when she’d rather be a singer. Especially the Japanese version of the title points to her realizing that it’s not so hard to be a hero after all. Meaning: You must be careful to use fire wisely and under control so that it will not hurt you. This episode was about Nathan and the proper introduction of Lunatic, so the fire reference is obvious. Nathan uses his ability to control fire to protect the public, and Lunatic uses his fire to kill criminals. Meaning: No one is better at finding a wrongdoer than another wrongdoer. This seems to be some sort of mistranslation of the Japanese episode title 「蛇の道は蛇」 which means “set a thief to catch a thief”. I can’t find the wording in the episode title anywhere, but the meaning is roughly the same as in “takes one to know one” and similar to “pot calling the kettle black”. I think the title refers to Yuri Petrov, since he’s not only a judge but also Lunatic – a NEXT criminal who is acting as a man of the law. Meaning: The chance will come again. Whether or not this is an actual proverb, I’ve not been able to find out. Not even when and where this phrase originated (if someone knows where it came from, please leave a comment) but the meaning is clear in any case. Just because you didn’t succeed this time, another opportunity will come. This episode was about Ivan and the title could mean that there’ll be another chance for him and Edward to meet, or it may mean that this time Ivan could help Edward. Meaning: The notion that children will only flourish if chastised, physically or otherwise, for any wrongdoing. Because this was the infamous baby-sitting episode, the first thing to pop to mind is of course the baby NEXT who could use some disciplining (if things just didn’t start flying around when he screams). It can also mean that Pao-lin has been disrespectful toward her parents and the gift she got from them. She realized it herself without being punished for it. Meaning: A quiet period just before a period of great activity or excitement. Heroes enjoying a rare vacation (except Barnaby who’s working to find information about the man who murdered his family) is of course the calm before the storm of Ouroboros taking the city hostage. Meaning: The future is determined; there are no more options; events will proceed in an irreversible manner; the point of no return has been passed. This phrase is from Roman times, “Alea iacta est”. With the events of the episode, it refers to the decision to let Jake Martinez free, but I think it also points to Ivan going undercover. There’s no going back in either case, and the only way is forward.